Showing 16 articles from January 25, 2017. The Aberdeen Police Department is reminding both drivers and pedestrians to use caution following a minor accident involving a pedestrian and police vehicle that occurred last week. U.S. Secretary of Commerce Penny Pritzker announced on Jan. 18 that there are commercial fishery failures for nine salmon and crab fisheries in Alaska, California and Washington. In recent years, each of these fisheries experienced sudden and unexpected large decreases in fish stock biomass due to unusual ocean and climate conditions. This decision enables fishing communities to seek disaster relief assistance from Congress. Aberdeen police are currently seeking an individual suspected of involvement in a recent shooting incident. Shortly after 2 a.m. on Jan. 15, Aberdeen officers responded to a firearm complaint at 111 N C Street in Aberdeen. Dispatch advised officers that one gunshot was heard from outside a party at a house at 801 E. 1st Street. 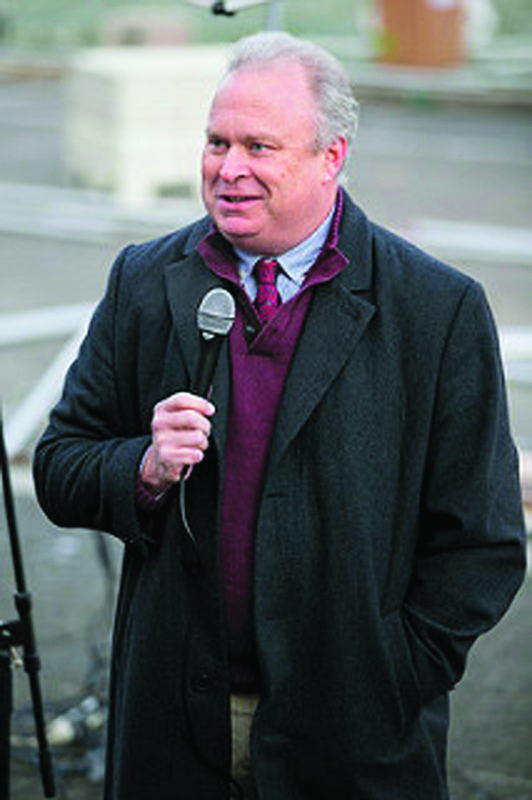 Rep. Jim Walsh, R-Aberdeen, spoke to a group of Second Amendment activists at the state Capitol on Friday, Jan. 13.. The group of about 150 gun owners -- some of them openly carrying rifles and handguns -- peacefully gathered on the steps of the Legislative Building. An increase in fishing and hunting fees has been proposed by the Washington Department of Fish and Wildlife.The increases would be the first since 2010, and if the proposal gets approval in the upcoming legislative session, hunters could see as much as a ten percent increase for license fees of all kinds. Recreational fishermen would see a ten dollar fee for each annual catch record card, and razor clam diggers could see their license costs go from just over $14 to $24 per year. The Washington Department of Fish and Wildlife has been trying to prep hunters and fishing enthusiasts for this increase for months through the forwarding of information and holding of public meetings explaining why the department is proposing the increases. The reasons for the increases include the department's goals of improving fishing and hunting opportunities, as well as resource protection. The night of Tuesday, Jan. 17, the rain came down in torrents outside the Winlock gymnasium as it washed away the weeks of snow and ice that had led to games being cancelled and rescheduled right up to that day. Indeed, the Castle Rock girls had their appointment with King's Way Christian postponed due to freezing rain south of Lewis County, but the Pirates from Adna braved the elements and were on a quest to pick up a league-leading fifteenth season win. At 9-1 in league play they improved to 10-1 with their win over Winlock last Tuesday, before falling to Wahkiakum on Jan 19, a team that no one has been able to beat this season, though Toutle Lake came within one basket of doing so. 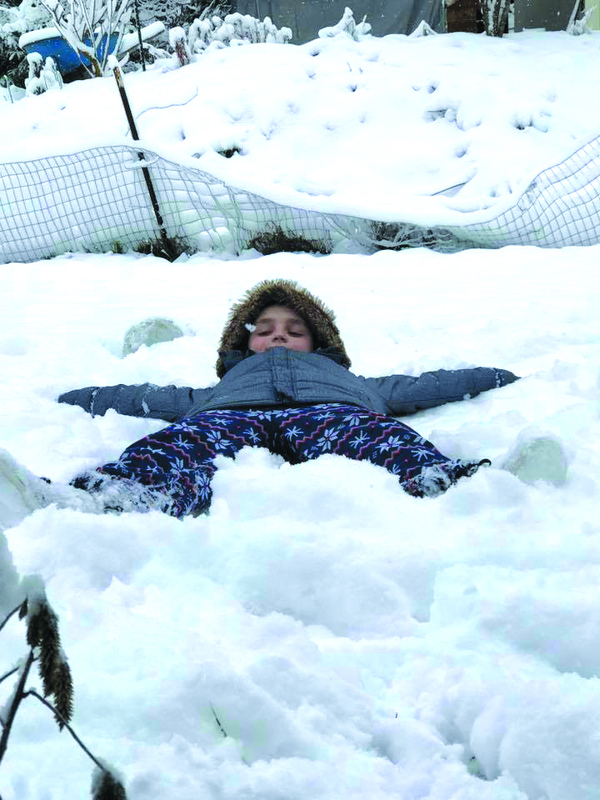 Photo by Corey Boughton - Enjoying making angels on a snow day duing the first snow fall in the Winlock area. The Lewis County branch of the American Association of University Women is offering two scholarships this year. A family of four had their Sunday interrupted by a fire that consumed their rental at 480 Avery Road West. Austin Olson and family had moved into the rental approximately 10 days previously. The call came into the Winlock Fire Department at 11:00 a.m., according to Winlock Fire Chief Russ Larson. Larson stated, "The structure appears to be a total loss. The fire was the result of a propane dryer malfunction. The residents were home at the time of the fire." The education birds of Raindancer Wild Bird Rescue draw crowds wherever they go. 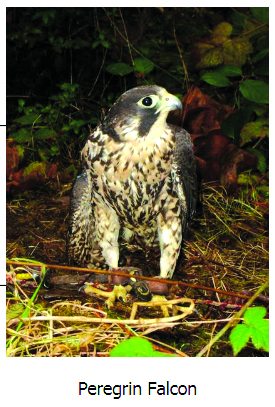 Meet a peregrine falcon and learn how this magnificent raptor became a crowd-pleasing education bird. Pictured left to right are Kim Mitchell, Joan Korpi, their mother Kathy, and Kevin Korpi. Kathy Korpi was born on August 20, 1941 to Adolph and Frances Legat in Toledo, and from that day on, Winlock would never be the same. Kathy graduated from Winlock High School in 1959; she traveled to Germany in 1960 to marry her high school sweetheart that same year. Kathy and Jerry settled in Winlock where they raised their three children, Kim, Joan and Kevin. They were a staple in the Winlock community, attending most of the events around town. Kathy gave so much to her community. She was the city clerk for many years, and everyone who came into the city offices was welcomed with a smile and a kind, "How can I help you?" She was a welcoming face to everyone who entered. Cy Meyer, former Winlock mayor remembered, "I had a great time working with Kathy. She was very good at being the city clerk." Kathy's daughter Kim recalled of her mother, "She loved the community, she was proud to be a part of the community and raise her family here." The community loved Kathy as well. Whenever she was at a community function there were many people who would gather around her. She was Winlock and Winlock was her. Kathy was a volunteer for several community entities. She volunteered at the Winlock Senior Center, the Lioness Club, and with the Egg Day Committee. Kathy sold advertising for the Egg Day Committee. As her daughter Kim said, "She was hard to say no to." When it came time for her family, son Kevin said, "She never missed anything. She never missed my boy playing baseball." Daughter Joan agreed, saying of her mom, "She was there rain or shine." Kim added, "She made every grandkid feel like they were her favorite. She was doing well with texting and Facebook. She would FB the grandkids just to see how they were doing." With the contents of a time capsule sealed at the Raymond Masonic lodge in 1956 on display at the Raymond Timberland Library until the end of the month, the Herald endeavored to learn a bit about Freemasonry. To that end, Patrick Webb, a local Mason, was posed such questions as: Who exactly are the Masons? How far back do their origins date? Are they a secret society? Photo Courtesy RHS AD Mike Tully - Saturday, former Raymond HS Football Coach Doug Makaiwi will be inducted into the Washington State Football Coaches Association Hall of Fame. Makaiwi was the head football coach for 22 years at RHS. This Saturday, former Raymond High School Football Coach Doug Makaiwi will be inducted into the Washington State Football Coaches Association (WSFCA) Hall of Fame at the WSFCA awards banquet in Sea-Tac. After finishing up a stellar college football career at Wenatchee Valley Community College and Central Washington University, Coach Makaiwi started his coaching career as an assistant at Winlock High School. After a few seasons at Winlock, Coach "Mak," as he was affectionately referred to, served as an assistant at Raymond for eight seasons until taking over the head coaching duties in 1983. Over the next 22 seasons, Coach Makaiwi compiled a record of 113-98-1. During that time, Raymond won six Pacific League titles and made the state quarterfinal round or better six times. The 1993 team, led by his son, Kalin, won the state title with a 20-6 victory over Reardan in Kingbowl XVII. After retiring from Raymond in 2009, Coach Makaiwi was an assistant at North Kitsap from 2011-2014. Known for his tough exterior and heart of gold, "Mak" had a positive influence on hundreds of student-athletes during his coaching career. 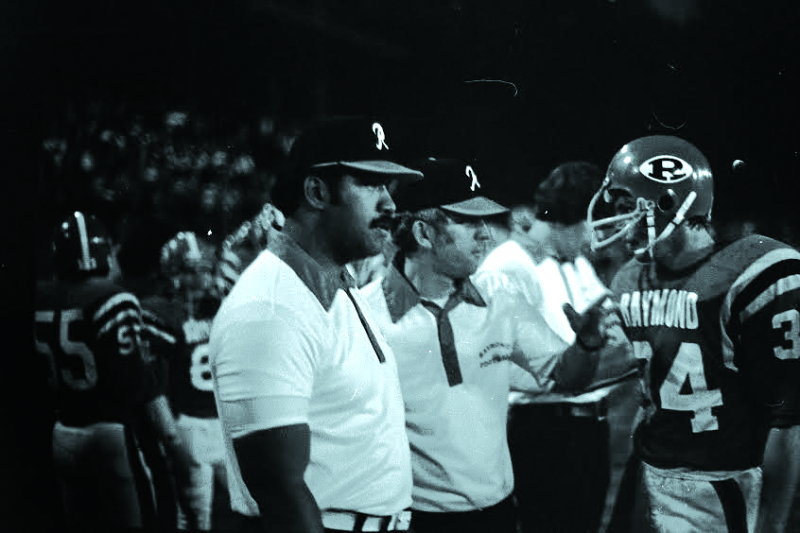 Born in Honolulu, Hawaii, Coach Makaiwi passed away from cancer in June of last year at the age of 68. Makaiwi had an immeasurable effect on what he meant to Raymond athletics and the students he coached. "Mak coached a whole generation of athletes at Raymond," Raymond HS Athletic Director Mike Tully told the Herald shortly after Coach Makaiwi passed. "He took over the football program as it was coming off of a number of years of success and kept the competitiveness of the program going for 22 years. Those of us who had Mak as a coach are still teaching our athletes some of the same techniques that he taught us when we were in school. That will continue for years to come. "Mak is definitely an icon at Raymond," Tully continued. "Mak had so much success as a football coach, that he will be remembered for that almost as much as his gentle giant personality. I don't know if I can really compare him to any other coach I've seen. He was a pretty unique coach and person." "It's kind of a collection of people who are all coming together to help raise awareness of art and teach art here in the North Cove-Tokeland area," explained Jeremy Bartheld, president of the North Willapa Artist Community, a not-for-profit organization he has helped to organize. Photo by Todd Bennington - Sunday Afternoon Live Board President Virginia Carlson shares a laugh with Luke Probasco, who provides sound support for SAL performances, at a preview event last Friday for the nonprofit's upcoming season. Sunday Afternoon Live held a sneak preview at the Raymond Theatre the evening of Friday, Jan. 20, of the performers slated for the upcoming 2017-18 season. The upcoming performance season will mark SAL's fifteenth year of bringing a wide variety of acts from around the region, nation, and world to perform for local audiences. Photo by Todd Bennington - Willapa Valley High third-year students at work in a metal shop class overseen by instructor Molly Majors. Educators with the Willapa Valley School District are doing their best to prepare students for tomorrow's workplace environment with a focus on developing practical skills, such as those related to computer programing, welding, and agriculture. In that regard, district high school students will be exhibiting some of their work at a demonstration fair scheduled for late March.